One of the most critical components to losing weight is diet adherence. Studies have shown that weight loss can be achieved regardless of the macronutrient compositions (percentage of calories coming from fat, carbohydrate, and protein), as long as a calorie deficit is achieved. But, people are more likely to stick to a plan and keep the weight off if they feel full and satisfied. Eating foods, such as walnuts, that are rich in fiber, protein, and healthy fat are more filling because they are metabolized slowly. In addition, walnuts are a low carbohydrate option that contain plant-based omega-3 alpha-linolenic acid (ALA). Long chain omega-3 fatty acids, DHA and EPA can be synthesized from ALA. Research has shown that diets rich in omega-3 fatty acids may reduce the risk of cardiovascular disease and may benefit those with type 2 diabetes, especially those with elevated triglycerides. A great way to improve your nutrition, while reducing your carbohydrate intake is to add walnuts to your meal plan. One ounce of walnuts (7 whole, 14 halves, or 1/4 cup) contains 2.5 g of ALA and is about: 183 calories, 18 g fat, 1.7 g saturated fat, 4 g carbohydrate, 2 g fiber, and 4 g protein.The key to adding healthy fats like nuts to your diet is to manage your portion appropriately. A small serving of nuts, although low in carbohydrates (only 4 g), can be high in calories. Overeating, even healthy food sources, can cause weight gain. Therefore, if you are adding walnuts into your meal plan as a snack by itself, be sure to keep it to one serving. If, on the other hand, you are placing a few in your salad, yogurt or paring them with a piece of fruit, such as an apple for a snack, limit your portion to about 7 halves, or 3-4 whole walnuts. A great way to increase your volume is to use chopped nuts. In addition to being a healthy fat, walnuts are a good source of protein and fiber. Fiber and protein can help to keep you full. Fiber rich foods can also help provide the body with a steady stream of glucose, preventing major blood sugar spikes. Studies have shown that people who eat a high fiber diet are more likely to maintain a healthy weight and have a reduced risk of heart disease and cancer. Walnuts are also a good source of the fat soluble vitamin, vitamin E which has antioxidant properties. Will Eating Walnuts Make You Gain Weight? Many people believe that because walnuts are mainly made of fat, that they should not eat them because doing so will make them fat. This is not true. In fact, studies suggest that people who consume nuts regularly weigh less than those who rarely consume nuts. Adding healthy fats like walnuts to your diet can be a great way to add fiber, protein, and satiating fat. When substituting walnuts for high carbohydrate ingredients like breadcrumbs and heavy sauces, you can actually reduce your overall calorie intake, lose weight, and improve blood sugars. But, it's important to be cautious to prevent overeating; always make sure you read labels before ingesting. Too many walnuts can lead to excess calorie intake which can cause weight gain. Try not to snack mindlessly out of the bag as the calories can add up quick. Keep in mind, too, that whole walnuts contain more calories than walnut halves or chopped walnuts, which means you can eat less, for more calories. When choosing walnuts, make sure you choose an unsalted version. Too much sodium can increase blood pressure and cause bloating. Walnuts should smell mildly nutty and taste sweet. If they smell like paint thinner, they have gone rancid and should be discarded. For maximum shelf life, store your walnuts in an airtight container in the refrigerator or freezer, depending on when you plan on using them. Keeping walnuts cold can prevent walnuts from going rancid. Walnuts that are stored in the refrigerator should be kept away from foods with strong odors, such as, onions, garlic, or fish, as walnuts can absorb the flavors of other foods. If you plan on grinding your walnuts to use as walnut meal, wait until you are ready to use it in your recipe to maintain great flavor. Walnuts are a very versatile food. They can be used as a replacement for breadcrumbs, as an addition to salads, side dishes, and oatmeal, or eaten by themselves as a snack. Here are some great ways to add walnuts to your meal plan. 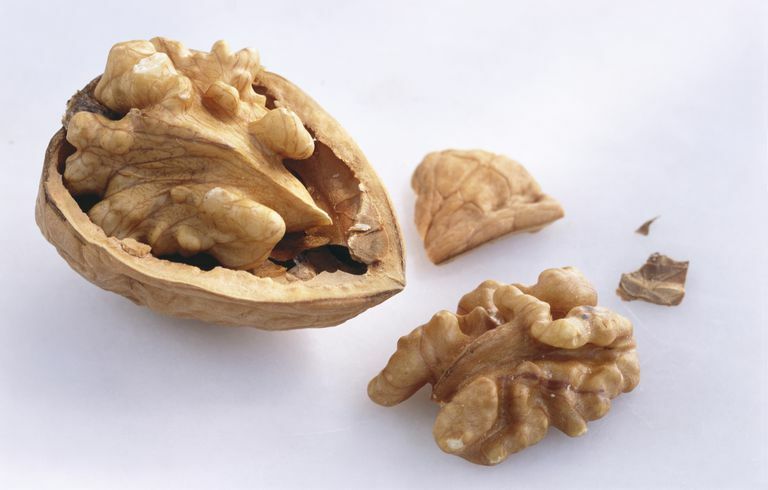 Use Walnuts as a Protein Topper: Eating lean protein can get very bland and boring. It's important to add flavor, but equally important to avoid large amounts of salt and fat in cooking. Instead of cooking with heavy sauces, frying, and using breadcrumbs to flavor your protein, use walnuts for added crunch, flavor, and healthy fats. Top chicken, turkey, lean beef, pork, or fish with a walnut coating. Purchase walnuts that are chopped or already ground, or grind them yourself. Skip Crackers, Bread, and Rice: Crackers, bread, and rice are often used as filler foods. The problem is that refined carbohydrates such as white crackers, white bread, and white rice can spike blood sugars, and perhaps even lead to more cravings. If you overeat these foods, you'll gain weight too. The next time you are having soup for lunch or a stir fry for dinner, reduce your carbohydrate intake and boost your fiber intake by adding a handful of walnuts to your recipes. Eat them as a snack as is (about 1/4 of a cup) or pair them with a serving of fruit (reduce the portion to half to compensate for calories). Make sure to choose unsalted. Chop or pulse in a blender and add to yogurt, oatmeal, and whole grain side dishes. Substitute walnuts in smoothies or meal replacements for flaxseed, hemp, chia, or nut butters. Skip on creamy dressings and toss walnuts into a salad to reduce saturated fat content. If you're ready to give walnuts a try, head to the kitchen and make some tuna walnut salad, bake cranberry walnut cookies, or try this recipe for pumpkin walnut muffins. Sacks FM, Gray GA, Carey VJ, et al. Comparison of weight-loss diets with different compositions of fat, protein, and carbohydrates. N Engl J Med. 2009;360:859-873. Champagne C, Kris-Etherton P, Raynor H, Wolf A. What and when to eat...what works for obesity treatment? Weight Management Matters. Academy of Nutrition and Dietetics. 2015; volume 13: 3. 8-11. Linus Pauling Institute. Essential Fatty Acids. California Walnuts. How to Buy Care for and Store Walnuts.